despite what you might be hearing from american media, everything is just fine here in south korea. there was a skirmish on the NK/SK border yesterday, but those types of run-ins have been happening for years and years. i feel like the entire world is watching this small peninsula with bated breath....and in the meantime all of us who are actually here in korea are just going about business as usual. south koreans are so used to hearing north korean threats that they almost remain completely unfazed. i don't mean to minimize the problem, as we all know that north korea is dangerous and unpredictable. and as a girl with 2 brothers who have served in the military (one korean, one american) and another who will soon be serving in the korean military, i really take the sacrifices of the marines' families to heart. but i ask you - please don't blow the situation out of proportion. we will all watch and pray that no more lives are lost, but continue to go on with our daily business. panic won't help the situation be resolved any quicker. in other news, things have been busy as ever. i've been severely under the weather lately & also had LASIK eye surgery last weekend - an experience and a half! hahaha. in keeping with the theme of my life, the surgery didn't go exactly as planned. i had the initial operation on friday evening, but unfortunately, woke up saturday morning unable to see clearly out of my left eye. when i went back to the doctor, they told me that something had happened to cause a wrinkle in my corneal flap, thus blurring my vision. the chances of that happening are like one in a million - a minute percentage of LASIK patients experience such a problem - but in my 23 years of existence, i've proven myself to be pretty darn good at blowing those statistics out of the water. hahaha. the doctor said "we need to do another surgery to correct it. right now. and this one will take longer than the first one. and it will hurt. sorry." comforting, right? his words were the truest ever spoken, though, and i appreciated the heads up. i'm glad to report that now, post-surgery #2, my vision is 20/20 and will actually improve as the weeks progress and my eyes continue to heal. as a contact/glasses-wearer for 15(ish) years, i must say - it is AMAZING to wake up in the morning and be able to see perfectly without scrambling for my spectacles or poking myself in the eye to get my contacts in place. even with my minor setback, i would definitely recommend LASIK and am really grateful to my korean family for the gift they gave me! a word to the squeamish, though - you are awake and fully aware throughout the entire operation. although the surgery takes only about 10 minutes, i can't lie - it's not all that pleasant to have your eye bulging out of socket & a guy digging into your corneas. sorry for the graphic description, but as they say - honesty is the best policy - right? and i'll testify that those 10 minutes are worth it for a lifetime of 20/20 vision! 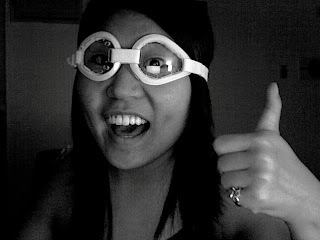 in addition, i got these awesome goggles that i have to wear while i sleep to prevent any accidental jabs to the eye. so trendy right now. HAHAHA. i realize that i run the risk of sounding like a 100-year old grandmother when i say this, but i'll proudly declare - modern day medical science is absolutely amazing. still can't believe that i can see so well without any help from glasses or contacts! i often end my posts asking you to pray for my korean language learning. i'm happy to report that your prayers are working...so THANK YOU! even though i was drugged up and feeling horrendous all weekend, i was able to communicate with my family better than we have been able to in the past 2 months. a small victory, but i consider it to be improvement nonetheless. i'm still light years away from fluency but it's encouraging to see my long study hours paying off as communication becomes slightly easier everytime we meet. on sunday afternoon, my grandmother came to my parents' house to visit me and i was watching some american tv. (my family's house is near an american military base in seoul so it's possible to pick up their tv station with american shows in 100% ENGLISH! amazing!) i was watching one of my favorite discovery channel shows - deadliest catch - and she sat down on the couch next to me. after a few minutes i realized that she couldn't understand a word of what was being said on the screen...she was getting a small taste of what my life has been like this entire year. i gave her the remote to change the station to a korean show, but she insisted that i continue to watch my american show. so i took the opportunity to do my best at translating for her. i was able to explain to her things like "grandmother, a typhoon is coming so these fisherman have to work really quickly to collect their crab. they haven't slept in 2 days and they are so tired but they have to work very hard!" and "i always watched this show in america. it's really interesting so i like it a lot!" she really appreciated my efforts and i was encouraged by the exchange. it was a sweet moment of victory as i sat on the couch hand-in-hand with my grandma. Hi! Glad you stumbled on my blog. I'm adding yours to my reader feed also. I love positive adoptee blogs... it's so amazing that you've met your family and that it's all gone so well. If you're looking at university korean programs and are considering Sogang, GO GO GO!!! It's GREAT. I think your Korean goals are the same as mine -- wanting to communicate with your birth family and from the research I did, Sogang seems to be the best program to learn to speak well. I admit, I still can't speak fluently or anything (it's a slower process than I originally thought it would be), but I can communicate and am seeing continued progress every day. Also, there are students who came from other programs (Ehwa, Yonsei) in my class who were higher levels at the other programs (and probably know more advanced grammar), but were placed in lower levels at Sogang because their speaking wasn't as good. Anyway, I could go on and on. If you have more questions or want to know more, feel free to email me markim916 at gmail.com. Good luck!